I'm a little late with a yule log post but you never know, someone might still want to make one and call it a New Year's Eve jelly roll :). Also, jelly rolls are perfect for any time of the year because you can make them in any flavor. 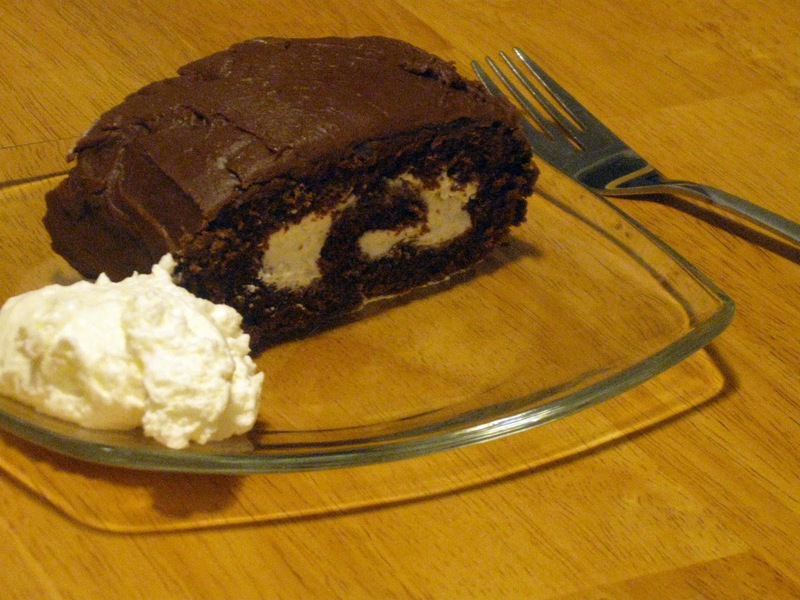 This particular one is chocolate cake, vanilla whipped cream frosting and chocolate icing that resembles fudge. I had some guests over and forgot to take a picture of it when it was whole because that would have been pretty also. It also was slightly more rounded initially but by the time I had taken the picture it had been wrapped in plastic wrap which always flattens desserts. I also used a 12"x12" pan because it was what I had but you could always "make" your own pan that is the correct dimensions with foil by bending it to make "sides" because the batter is fluffy and won't push the sides down. The recipe for the cake and frosting is from Hershey's but the filling is a basic whipped cream because I didn't want a mocha filling. A lot of people don't make jelly rolls because they're afraid it will break or fall apart. I have had my fair share of broken cake, jelly rolls and sheet cakes (oops!). As long as you follow the directions and it's a quality recipe it should turn out very well to say the least. Happy Baking! Heat oven to 375°F. Line 15-1/2x10-1/2x1-inch jelly-roll pan with foil; generously grease foil. Unroll cake; remove towel. Spread with filling; re-roll cake. Working quickly, spread chocolate glaze over top and sides. Cover; refrigerate until just before serving. Cover; refrigerate leftover dessert. 10 to 12 servings. 1. In a large bowl, beat cream until it begins to thicken. Add sugar. Beat until stiff peaks form; chill. 1 Melt butter in small saucepan over low heat; add cocoa and water. Cook, stirring constantly, until smooth and slightly thickened. Do not boil. 2 Remove from heat; cool slightly. Gradually add powdered sugar and vanilla, beating with whisk until smooth. About 2/3 cup.